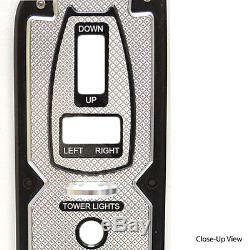 Mastercraft 200-255 Black / Silver Aluminum Boat Armrest Control Panel 509680. 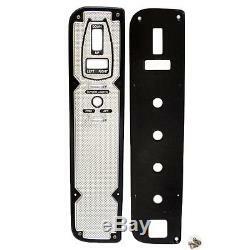 Boat part number 8400671 is a NEW, out of the box, boat armrest control panel from MasterCraft, part number 509680. Commonly used on 200-255 models. 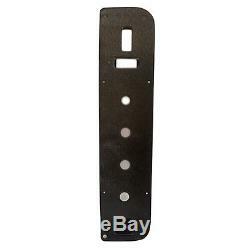 This panel measures approximately 12 3/4" L x 2 7/8" W x 1 3/8" D overall and has (4) 1/8" dia. Mounting holes with 2 3/8" x 6" apart center on center. Features the following blank cutouts: (2) 1/2" x 1 1/8" rectangular and (1) 1/2 dia. Overall Dimensions: 12 3/4" L x 2 7/8" W x 1 3/8 D.
Blank Cutouts: (2) 1/2" x 1 1/8" rectangular and (1) 1/2 dia. Customers please note every computer shows colors differently. Instruction / installation manual not included. A Message from Great Lakes Skipper. We stand behind our products and maintain great relationships with our customers. The physical address you provide must be deliverable by ANY service of our choice. Don't live in the US or Canada? No need to feel left out. You may also reach us using the Ask a Question link at the top of the page. Feel free to send us a message any time! The item "Mastercraft 200-255 Black / Silver Aluminum Boat Armrest Control Panel 509680" is in sale since Wednesday, January 29, 2014. This item is in the category "eBay Motors\Parts & Accessories\Boat Parts\Accessories & Gear\Other". The seller is "greatlakesskipper" and is located in Racine, Wisconsin. This item can be shipped to United States, Canada, United Kingdom, Denmark, Romania, Slovakia, Bulgaria, Czech republic, Finland, Latvia, Lithuania, Estonia, Australia, Greece, Portugal, Cyprus, Slovenia, Japan, Sweden, South Korea, Indonesia, Taiwan, Thailand, Belgium, France, Hong Kong, Ireland, Netherlands, Poland, Spain, Italy, Germany, Austria, Israel, Mexico, New Zealand, Philippines, Singapore, Switzerland, Norway, Saudi arabia, United arab emirates, Qatar, Kuwait, Bahrain, Croatia, Malaysia, Chile, Colombia, Costa rica, Dominican republic, Panama, Trinidad and tobago, Guatemala, El salvador, Honduras, Jamaica.